Using http handlers we can add new functionalities to Web Server. Files with new extensions like .text for a text file can be handled by Web Server by using http handlers. The future of customization can lead to hosting .jsp pages in IIS by finding adequate ISAPI extensions. To create customized http handler we need to Create a C# class library as “Examplehandler” and implement IHttpHandler interface. eg: To configure Web services to enable calls from Ajax enabled client script, we need to register the ScriptHandlerFactory HTTP handler in web.config. Typed DataSet includes Type-safe into Dataset fields so as to protect it from runtime mismatch. These classes inherit directly from DataSet class. dsEmp.EMPLOYEE.empno = “12345”;//This will generate compile time error. Typed dataset is very much similar to a normal dataset; the only difference is that the schema is already present for the same. And any mismatch in the column will generate compile time errors rather than runtime error as in the case of normal dataset. Also accessing the column value is much easier than the normal dataset as the column definition will be available in the schema. 1) Using Visual Studio .NET IDE. Open VS.Net command prompt and Type XSD /? For the help on this exe. 1. 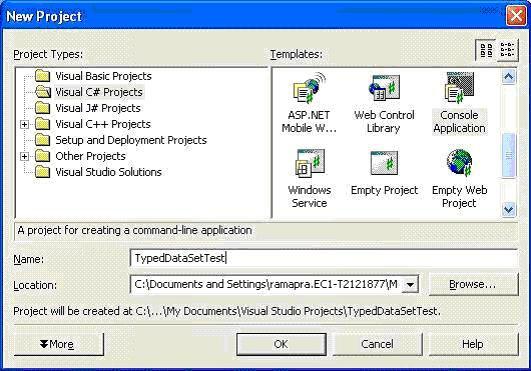 Open VS .Net IDE and Click on File -> New -> Project and Select Console Application. 2. Enter name for the project. Say TypedDataSetTest. 3. Right click on the solution and click on Add-> Add New Item will show a dialog box. Select DataSet from templates pane, give the name (Say TypedDs.xsd) and click on Open. This will add file by name TypedDs.xsd to the solution. 4. 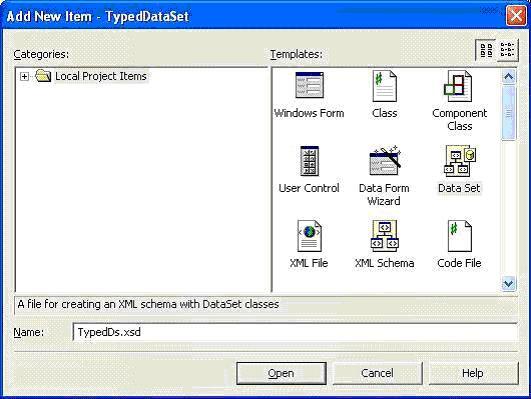 Click on the Server Explorer browse to the database and drop the table on the TypedDs.xsd file. 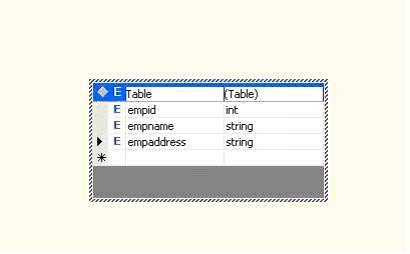 If we check the xml file for the same then we can see the schema for the table. This dataset can be used in the same manner as the normal dataset to get the data. Global Temporary table – defined using double pound signs (##) and visible to all users. Table Variables is a data type that looks similar to a table but has a tighter lifetime scope (i.e within a function, stored procedure or batch that it is declared in) and should be used with small datasets. WCF provide the functionality of transactions based on WS specification which allow other language like JAVA to take advantage of this transaction that is the best part of WCF embracing other languages. Under transactions, every activity in the unit must either all succeed or all should fail. TransactionFlowOption.NotAllowed: This is a default option. Using this option no transaction is applied. TransactionFlowOption.Allowed: This means client can use transaction but it is not compulsory. TransactionFlowOption.Mandatory: This option specifies that client must call the WCF service in a transaction mode. If the WCF service is called without transaction, ‘FaultException’ will be raised.